Mapeo de transferencia de momento y optimización genética para arreglos de estructuras similares a tornillos de Arquímedes sumergidos en un flujo con velocidad del campo lejano bajas. The first PDC workshop, PDC14. dynamics. Hence, this area has many more unanswered questions than in-depth understanding. Furthermore, recent developments in the design of dynamical cores (significant increase of resolution, move to non-hydrostatic equation sets etc), extended process physics (prognostic microphysics, 3D turbulence, non-vertical radiation etc) and predicted future changes of the computational infrastructure (Exascale with its need for task parallelism, data locality and asynchronous time stepping for example) is adding even more complexity and new questions. This workshop brought the international leaders in the field together in order to exchange ideas on the state of the art, facilitate collaboration and instigate joint projects. 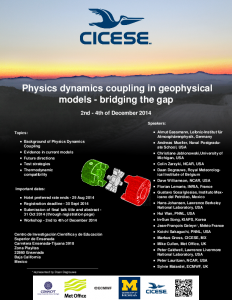 The program with (most) of the talks can be found at pdc.cicese.mx.